Soon-to-be-former CM Al Hoang is not sitting still in the wake of his unexpected electoral loss. 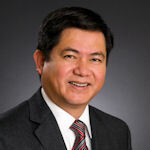 Houston City Councilman Al Hoang, who narrowly lost his reelection bid in a surprise upset last week, has filed paperwork to challenge state Rep. Hubert Vo for his District 149 seat next fall. There is much overlap between Hoang’s City Council District F and Vo’s state District 149, both of which center on Alief. Vo, a Democrat, was re-elected to a fifth two-year term in 2012. Hoang, a Republican, will complete his second two-year term on council this year, yielding in January to Richard Nguyen, an employee in the city’s Solid Waste Management Department who beat him by about 200 votes in last week’s election. Vo said he has heard talk for years that Hoang may challenge him, but said he does not consider the councilman a rival. He also denied whispers that he had propped up council candidates against Hoang. Vo acknowledged speaking with Nguyen earlier this year, but he said he merely advised him to have a platform, not simply oppose Hoang. “I gave him some advice, but I never publicly endorsed him, I never helped his campaign,” he said. I have no idea whether there’s anything personal to this or if Hoang always had HD149 in his sights for his post-Council career. HD149 is a fairly purple district, though Rep. Vo has not had any close calls since his razor-thin initial victory in 2004. He’s also never faced an Asian opponent, which may add a different dimension to the race. Numbers-wise, the district leaned red in the Republican wave year of 2010, though Bill White defeated Rick Perry there by a 53.7 to 44.8 margin. Compare that to 2008, in which President Obama carried the district by a 57.1 to 41.8 margin, and you can see that turnout is definitely a factor. Interestingly, 2010 was a less red year in HD149 than 2006 was, which suggests that demographic change in the district is also a factor. Be all that as it may, this is now the most interesting State Rep race in Harris County. Both districts are comparable in size – actually, Council districts are a bit larger – but the universe of voters in each is different, because turnout in the odd years is so much lower. While CM Hoang has a leg up on some of the opponents Rep. Vo has faced – and bear in mind, Rep. Vo twice defeated former Rep. Talmadge Heflin, and also beat HISD Trustee Greg Meyers, so he has won against people who have been successful running for office before – it’s fair to say there are a lot of voters in HD149 who have never cast a ballot that included him on it. He will still need to introduce himself to much of the district. That’s some cold hard math right there. It is difficult to believe that Hoang has a path to victory having just been turned out of office by (an admittedly small number of) voters. His premise would seem to be that some 5-10 times the numbers of his base vote have stayed home in odd-numbered election years. Tenuous at best. Houston voters from HD-149 will get to choose between the two Vietnamese American politicians Al Hoang (R) and Hubert Vo (D). Hubert Vo is a real Vietnamese American politician while Al Hoang wears both coats of a Vietnamese and Vietnamese American politician.